All sandwiches served with homemade chips. Add $1.00 for fries. Flame broiled beef patty with mushrooms & Swiss cheese, served with homemade chips. Fresh Prime Rib, Swiss cheese, beer battered onion rings & our creamy, mild horseradish sauce of German rye bread. Served with homemade chips. Sliced Pork Loin Breaded & Deep Fried. Served on Fresh Baked Bread with Mayo, Onions, Roma Tomatoes & Romaine lettuce. Served with homemade chips. Breaded pork loin topped with black forest ham & Swiss cheese on French bread with mayo, onions, tomatoes & romaine lettuce, served with homemade chips. Grilled pork steak on French bread with mayo, sauteed onions, tomatoes & romaine lettuce. served with homemade chips. Our World Famous homemade meatballs topped with marinara sauce & Swiss cheese on toasted French bread. served with homemade chips. Made fresh with diced potatoes & carrots. 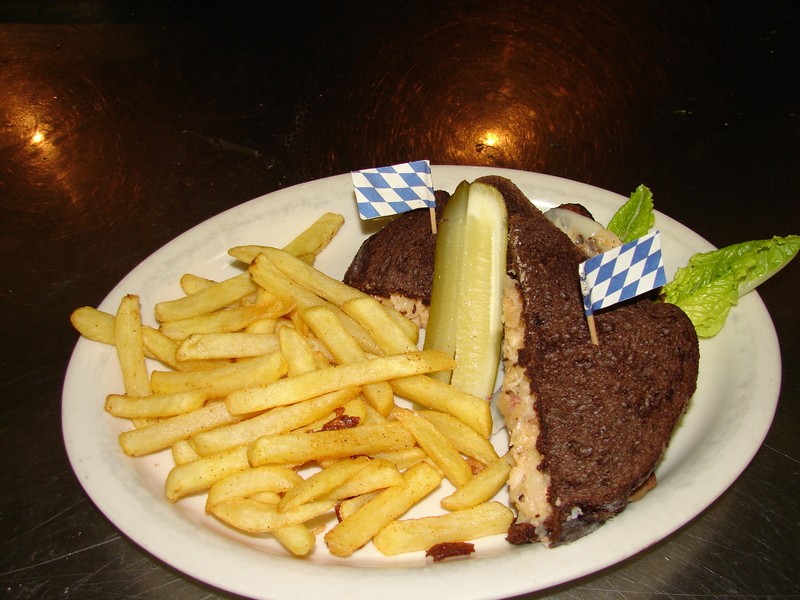 Shaved Bavarian roast beef with Swiss cheese, sauerkraut & thousand island dressing on German rye bread. served with homemade chips. Your choice of beef steak or Chicken, topped with homemade gravy, served with French fries. Sliced pork delicately breaded & fried, topped with our mushroom sauce, served with red cabbage & spaetzle. Sliced pork delicately breaded & fried, served with German potato salad & red cabbage. Romaine lettuce, tomato, onion, sliced hard boiled egg, black forest ham, carrots, cucumber & Swiss cheese. Served with homemade buttermilk or red wine dressing. Two of our grilled Homemade pork sausages served with kraut & German Potato Salad. Choice of pork bratwurst or jalapeno currywurst on French bread. Pork loin roast topped with our dark natural sauce, served with sauerkraut & German potato salad.